San Francisco, October 4, 2018: The modern holiday party is overflowing with media. Photo booths, selfies, photographers, videographers, livestreams, social media and more. But one can't help but feel that in our media overloaded minds, we've shrunken our social souls. Now imagine an event where all the media created from all the attendees — videos, photos, GIFs and livestream — are assembled in real-time into a continuous montage and engaging guest experience. An immersive community creation – a new entertainment lifeform. 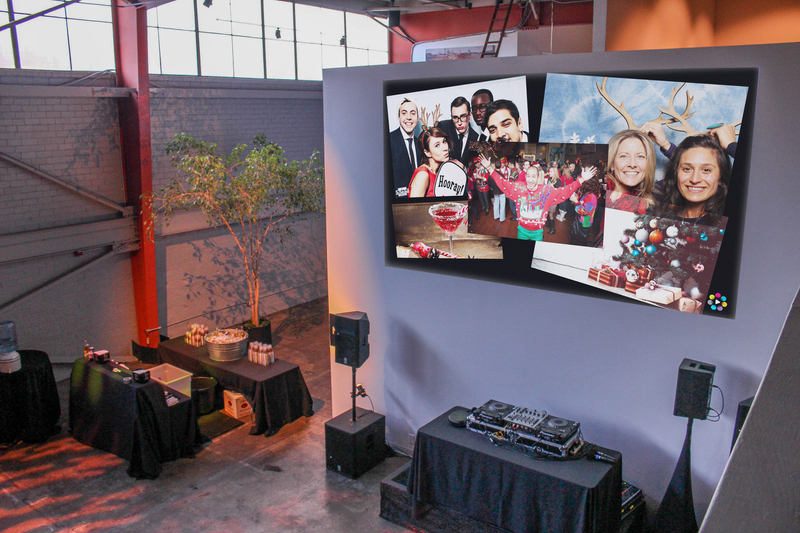 iObjx, a San Francisco-based media-tech startup has developed a new, autonomous, cloud-based mixed media DJ service, known as eObjx (event objects), that uses artificial intelligence and crowdsourced media to create a living event entertainment. eObjx creates a continuous visual mix in real-time designed to play for the duration of the event. eObjx grows always looking for the most recent uploads to add to the remix. No playback with eObjx is ever the same. "eObjx uses artificial intelligence to create all kinds of visual mixes and experiences that aren't humanly possible to conceive without time and plenty of planning and money. Almost everyone thinks that eObjx is just another looping video or slideshow but once they experience it, the "awesomes", "so cools" and "this is totally new" are inevitable. Our customers’ reactions have confirmed that we've created something entirely new," shares John B Graham Co-Founder/CEO of eObjx . This software as a service (SaaS) produces a cinematic array of dynamic animated visuals – to project on the wall or connect to big screen televisions/large video monitors for the greatest eye-popping, look-up-from-your-phone impact. The company takes privacy very seriously. What happens on eObjx stays on eObjx. The service collects no personal information and disappears when the party ends. This holiday season, it's time to think outside the photo booth. Or rather, think next generation entertainment that creates the ultimate memorable experience for your guests, clients and executives. eObjx believes that the collective sum of “us” is always greater than the individual part of “me,” and nowhere does that ring more true than in a holiday gathering. Sure, a software that creates signature event coverage through crowdsourcing is cool, but eObjx is more. eObjx was designed to put the social back into social media, creating a shared entertainment and memorable event experience together. Using eObjx is simple since it’s web based. No need for anyone to deal with app stores, downloads, logins, and it is both ad and social media free. eObjx is rented by the hour from $50-90/hr with several add-ons available. For more information, visit www.eobjx.com. ABOUT THE COMPANY (iObjx) iObjx is a San Francisco-based company that has been quietly developing a new paradigm and experience platform for interacting with digital and real-world objects – intelligent and interactive objects. iObjx demonstrates only a portion of what it can already do by powering the current web applications of eObjx and Group Greets. iObjx was inspired by Sir Tim Berners-Lee, inventor of the World Wide Web, and his vision for “intercreativity” versus what he sees as less than optimal, “broadcast and consume.” The company is on a mission to provide a platform to power others to create meaningful pixels together. iObjx is an atypical startup comprised of a curious, experienced, and diverse team that grew up in the worlds of technology, art, marketing, finance, and entertainment. iObjx continues to be stealth and self funded. San Francisco, May 09 2018: Las Vegas, well-known for standing residencies of the top global music DJs, recently welcomed a new autonomous DJ of the artificially intelligent and mixed media kind, eObjx (pronounced E-objects). For its inaugural 4.01 Race for Financial Fitness, Junior Achievement of Southern Nevada recently partnered with San Francisco-based internet entertainment service company, eObjx, to add a new level of event entertainment and guest engagement. In April, eObjx played continuously poolside on the big screen during the race’s official after party at the Hooters Hotel and Casino. Sponsors, guests, and runners uploaded event photos, videos, and GIFs as eObjx autonomously self-assembled these media “objects” on-the-fly, into ever-changing continuous remixes displayed on the screen. Most of us have seen the projected videos at various parties and events in which photographs, videos and scanned newspaper articles are projected onto a screen, usually on a continuous loop showing the same thing in the same way and produced beforehand usually by a single author. While often entertaining, these relatively static presentations are about the past and one person’s point-of-view. eObjx is about the present, active group participation and creation, and intelligent software that “feeds” on content in real-time. eObjx is a spinoff to the Internet culture. No longer are we content to sit passively in front of a screen and watch the world go by. Be it Facebook, Twitter or Skype, we now want to be engaged in it and have it respond almost instantly. And if the feedback from this poolside event is any indication, eObjx may very well be coming to more Vegas poolside events very shortly. Adds Graham, "eObjx is the first artificially intelligent mixed media DJ"
And a relatively inexpensive one, renting on an hourly basis for $50-$90 an hour. For more information, visit www.eobjx.com. iObjx is a San Francisco-based company that has quietly spent the past several months developing a new paradigm and experience platform for interacting with digital and real-world objects – intelligent and interactive objects. iObjx demonstrates only a portion of what it can already do by powering the current web applications of eObjx and Group Greets. iObjx was inspired by Sir Tim Berners-Lee, inventor of the World Wide Web, and his vision for “intercreativity” versus what he sees as less than optimal, “broadcast and consume.” The company is on a mission to provide a platform to power others to create meaningful pixels together. iObjx is an atypical startup comprised of a curious, experienced, and diverse team that grew up in the worlds of technology, art, marketing, finance, and entertainment. iObjx continues to be stealth and self-funded.